AMES, Iowa - Xinwei Wang had a hunch that spider webs were worth a much closer look. 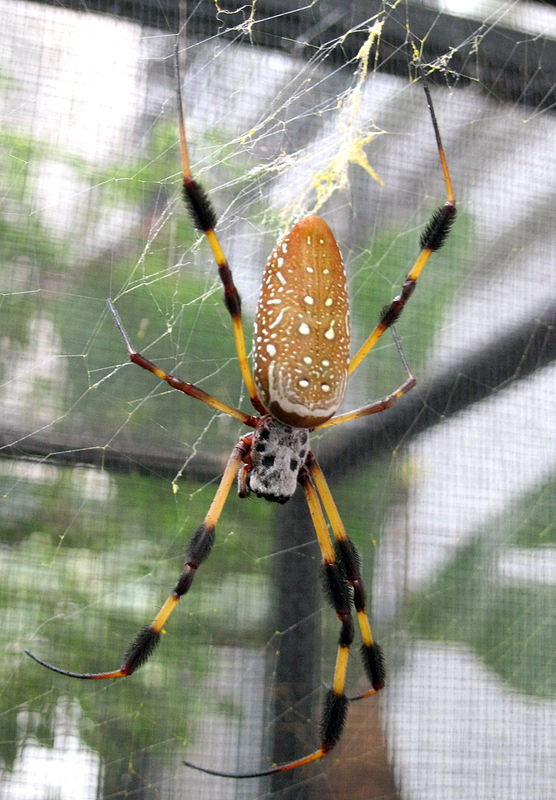 So he ordered eight spiders - Nephila clavipes, golden silk orbweavers - and put them to work eating crickets and spinning webs in the cages he set up in an Iowa State University greenhouse. Wang, an associate professor of mechanical engineering at Iowa State, studies thermal conductivity, the ability of materials to conduct heat. He's been looking for organic materials that can effectively transfer heat. It's something diamonds, copper and aluminum are very good at; most materials from living things aren't very good at all. But spider silk has some interesting properties: it's very strong, very stretchy, only 4 microns thick (human hair is about 60 microns) and, according to some speculation, could be a good conductor of heat. But nobody had actually tested spider silk for its thermal conductivity. And so Wang, with partial support from the Army Research Office and the National Science Foundation, decided to try some lab experiments. Xiaopeng Huang, a post-doctoral research associate in mechanical engineering; and Guoqing Liu, a doctoral student in mechanical engineering, helped with the project. "I think we tried the right material," Wang said of the results. What Wang and his research team found was that spider silks - particularly the draglines that anchor webs in place - conduct heat better than most materials, including very good conductors such as silicon, aluminum and pure iron. Spider silk also conducts heat 1,000 times better than woven silkworm silk and 800 times better than other organic tissues. A paper about the discovery - "New Secrets of Spider Silk: Exceptionally High Thermal Conductivity and its Abnormal Change under Stretching" - has just been published online by the journal Advanced Materials. "Our discoveries will revolutionize the conventional thought on the low thermal conductivity of biological materials," Wang wrote in the paper. The paper reports that using laboratory techniques developed by Wang - "this takes time and patience" - spider silk conducts heat at the rate of 416 watts per meter Kelvin. Copper measures 401. And skin tissues measure .6. "This is very surprising because spider silk is organic material," Wang said. "For organic material, this is the highest ever. There are only a few materials higher - silver and diamond." Even more surprising, he said, is when spider silk is stretched, thermal conductivity also goes up. Wang said stretching spider silk to its 20 percent limit also increases conductivity by 20 percent. Most materials lose thermal conductivity when they're stretched. That discovery "opens a door for soft materials to be another option for thermal conductivity tuning," Wang wrote in the paper. And that could lead to spider silk helping to create flexible, heat-dissipating parts for electronics, better clothes for hot weather, bandages that don't trap heat and many other everyday applications. What is it about spider silk that gives it these unusual heat-carrying properties? Wang said it's all about the defect-free molecular structure of spider silk, including proteins that contain nanocrystals and the spring-shaped structures connecting the proteins. He said more research needs to be done to fully understand spider silk's heat-conducting abilities. Wang is also wondering if spider silk can be modified in ways that enhance its thermal conductivity. He said the researchers' preliminary results are very promising. And then Wang marveled at what he's learning about spider webs, everything from spider care to web unraveling techniques to the different silks within a single web. All that has one colleague calling him Iowa State's Spiderman. "I've been doing thermal transport for many years," Wang said. "This is the most exciting thing, what I'm doing right now." This is one of the golden silk orbweavers spinning webs for Xinwei Wang's research project. Larger photo. Photo courtesy of the Xinwei Wang research group. Xinwei Wang, an Iowa State associate professor of mechanical engineering, is leading a study that found spider silk is very good at transferring heat. Spider silk, in fact, conducts heat as well or better than most metals. The findings were recently published in the journal Advanced Materials. Now that Wang knows a lot about spiders and their webs, one colleague calls him Iowa State's Spiderman.